What about a rooster in a wizard hat made any of you think that I have artistic integrity? The Plot: Sam is a little kid who’s afraid of the dark, and decides that it’s time to venture into his closet and capture Darkness once and for all! Michael is the adult man who records a detailed video walkthrough of the game with sarcastic commentary. Yeah, so this is an interesting departure from what I normally do, especially considering how close the Oscars are. Whatever, though, I’m already over them. Anyway, so my friend and I spent about an hour watching this guy play through and narrate the original adventure of the great, indispensible, heroic Pajama Sam. 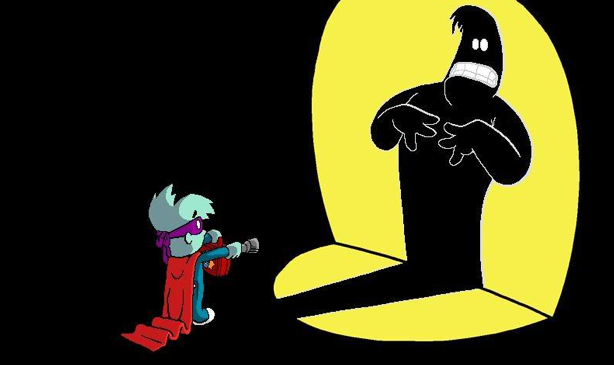 For those of you who never played any of the Pajama Sam games, y’all were missin’ out, fo shizzle. 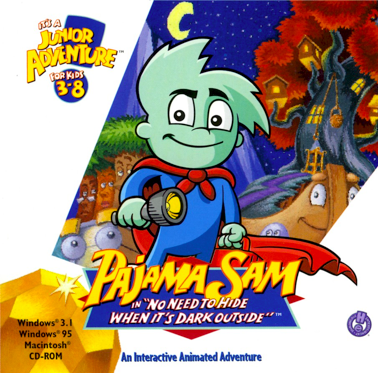 Pajama Sam was one of many excellent characters developed by Humongous Entertainment, a company that made click-through computer games for children in the ‘90s. 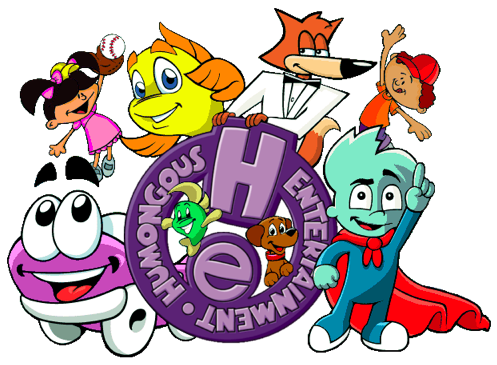 Along with the mighty Sam, they also created such timeless personalities as Spy Fox, Freddy Fish, and Putt-Putt. I grew up playing these games. That’s pretty important context to understand for the rest of this review. Now, Pajama Sam was not the hardest HE game, but it had some pretty challenging puzzles that took some time and devotion to figure out. Still, to the best of my recollection, Spy Fox in Dry Cereal was always the most difficult one. That having been said, I was pretty damn impressed by Michael’s (who from this point on I think shall be referred to as “Arglefumph,” because that’s his YouTube name) crazy ability to just waltz through all of these puzzles. I understand that the game was designed for children, but some of these things are hard. You don’t get any hints, and the solution is often pretty convoluted and abstract. In that respect, it’s an impressive walkthrough, and efficiently accomplishes everything a good walkthrough needs to do. Arglefumph takes the viewer on a rollercoaster ride (or mine cart ride, if you will) through the Land of Darkness, describing in the timeliest fashion possible how to complete the game and finally confront Darkness himself. In all actuality, this is a heart-thumping climax. He does the whole thing in about an hour, which was a good length for us when we were watching, because we were too tired to go any longer than that. That’s not the end, though. You see, one thing that makes the HE games so terribly smashing is that they all have exciting variations. Let me go into a more detailed example. As I mentioned in the plot description, Sam travels to the Land of Darkness to vanquish his greatest enemy, but when he gets there he’s captured by some evil trees that steal all the items he needs to defeat Darkness. 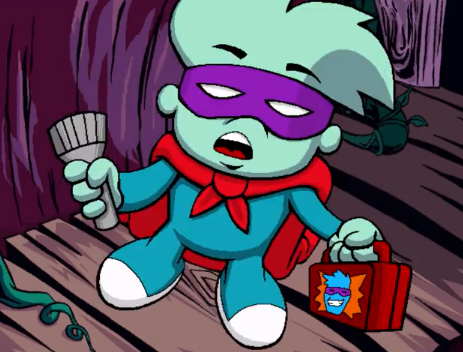 So, before Sam can face Darkness, he must first recover his flashlight, his Pajama Sam mask, and his Signature Edition All-Metal Pajama Man Lunchbox—er, I mean, his Bad Guy Containment Unit. These items are spread throughout the Land of Darkness, and each has its own complicated puzzle for retrieval. However, there are a couple different possible locations for each item, and the game chooses randomly at the start where they’re going to be. Now, Arglefumph is a professional, clearly, so he does not merely do one six-video walkthrough of the game. He does a second six-video walkthrough just so he can show every possible location, except one, because the stupid game would never put the mask in the room with the dancing furniture, so he just had to describe that one. As I’ve mentioned, Arglefumph is really solid at the walkthrough aspect, but I believe I also mentioned something about “sarcastic commentary.” Commentary can make or break this type of video series. No one wants to sit down and watch an hour-long series of some guy playing through a children’s puzzle game if all he’s doing is, “And then you go to the river, and then you ride the boat down the river, and then you go up the geyser.” In the wise and incredibly profane words of Dennis Hopper, “F*#$ that s!&%.” Arglefumph is a commentator with personality, wit, and a horrendously punny sense of humor. Admittedly, I did not notice this as much during the first six videos of the series. 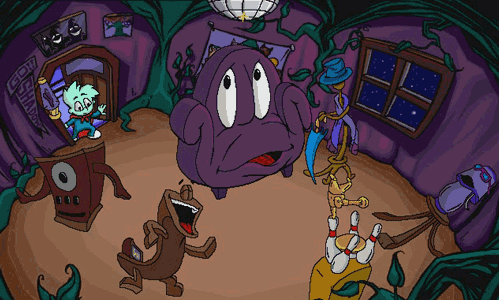 I don’t know if it just wasn’t there, or if I wasn’t paying attention because Nina and I kept loudly reminiscing about how awesome a game Pajama Sam is, often overpowering the video itself. For the first walkthrough, though, Arglefumph is much more business oriented. He really lets loose for videos seven through twelve, though. That’s when he gets really fun to listen to. He makes jokes, he holds conversations with the characters, and provides voice-over; he sings some of the songs; it’s really quite great. Man, you face those fears! What did this signify for me as a viewer? It meant that Arglefumph and I shared a similar appreciation for these games, now a distant facet of my remembered childhood, but one that I will always cherish. Arglefumph has a pretty successful YouTube channel, with 2,257 uploaded videos. I’m not positive, because I have not looked at all of them, but I think most, if not all of those videos are walkthroughs of children’s computer games. Most of them are Nancy Drew mysteries, but he also does some other HE games, Kingdom Hearts, Mario Bros., Legend of Zelda, Indiana Jones, Oregon Trail, and others. When you write it out, it makes this dude sound really weird, but I didn’t get that impression. I mean, everyone needs a hobby, right? He must be painfully aware that nobody plays these games anymore, and so therefore nobody needs his help with them. I think his target demographic is mostly just people like Nina and me, who played these games as children and occasionally like a humorous episode of remembrance. If you happen to be of a similar state of mind, I highly recommend Arglefumph’s videos. It is an awesome way to spend a Thursday evening in Berlin. And that’s the story of how Second Breakfast wrote almost 1300 words about Pajama Sam. February 17, 2013 in Movie Review. Well that sure made my morning! Pajama Sam and other cultural highlights of Berlin. These games are the coolest.